As a Polish speaker, I was also fortunate to host this concert, and I had the opportunity to interview composer Michael Abels about the meaning behind the different sections of his piece, “Liquify”. 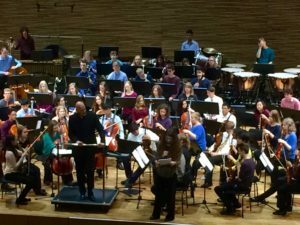 Not only was it informative for the audience, but it was also very beneficial for the orchestra members to hear directly from the composers about the inspiration for each section. 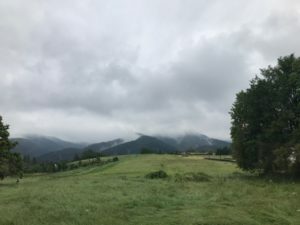 After lunch, we departed the Penderecki Center and began our bus ride to Zakopane, a beautiful winter resort town nestled in the Tatra mountains, the section of the Carpathian that straddles the border between Poland and Slovakia. The ride there consisted of a scenic route, filled with twisting roads, pastures, and alpine lakes. 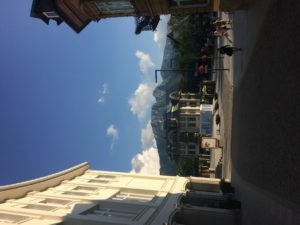 Upon arrival at Zakopane, we spent a few hours exploring the town, and had the opportunity to buy souvenirs for home. We then departed for dinner at a traditional Polish highlander restaurant. 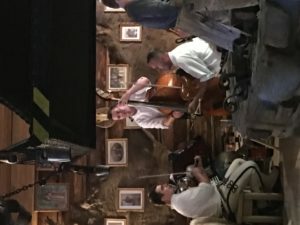 We were greeted by the sound of folk music, and the musicians were singing in the polish mountain dialect, which was very interesting for me to hear and try to decipher as a Polish speaker. Dancers were also there, dressed in traditional highlander outfits, and they danced energetic dances, and at one point brought out hatchets as part of the performance. We enjoyed traditional highlander food, such as sheep/goat cheese with jam, potato cakes, sausage, and cabbage. A highlight of the evening was when the dancers invited members of our group to dance, and even Maestro Smith danced! This was a great way to end the Polish portion of our tour, and although we are sad to be leaving such a wonderful place, we are excited to explore Budapest and what it has to offer.